The monsoon was active and in full force in north, northwest and parts of northeast India over past few days, with heavy rainfall reported from several districts. Heavy rains in the Indo-Gangetic plains as well as over the hill states have led many rivers to swell beyond their danger levels. Flooding has been reported in Uttarakhand, Uttar Pradesh, Assam and Rajasthan killing at least 21 people. 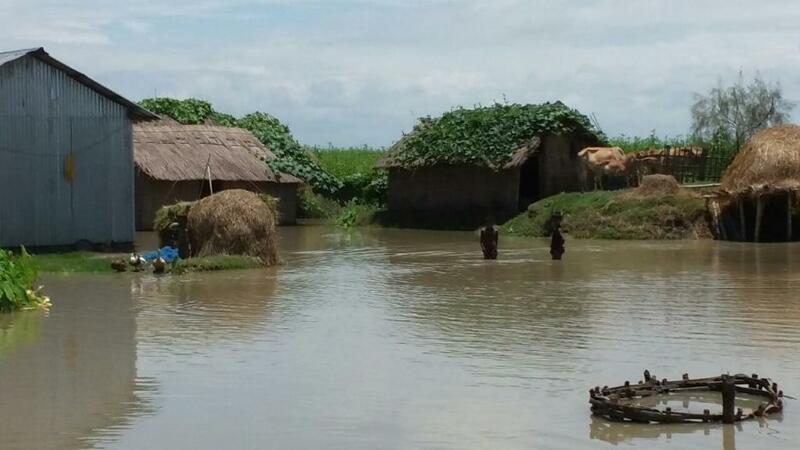 About 30 villages have been reportedly submerged due to floods on the banks of the River Kosi in Bihar. Parts of Delhi, Chandigarh, Punjab, Haryana and Himachal Pradesh also received heavy rains. Rain-related incidents were reportedly responsible for 8 deaths across Uttar Pradesh with heavy rains expected in the state on Monday as well. Kota, Jaipur and Bharathpur in Rajasthan also experienced uninterrupted over Saturday and Sunday, after heavy rains in eastern Rajasthan last week. As excess water was released from the Panchgna dam, 53 villages in Kairauli district were placed on red alert amidst heavy rainfall. The army has been summoned to help with rescue and relief operations in the area. Assam, has continued to be affected by widespread flooding with close to 200,000 people affected by the floods and a swollen Brahmaputra. Uttarakhand was once again the worst-hit by rain which triggered landslides in the state. that blocked national highways and affected travel to Badrinath and Kedarnath. Landslides and two separate road accidents have claimed at least 10 lives and affected travel to Badrinath and Kedarnath. Eight weather stations across the state have recorded over 100 mm of rains on Saturday with Roorkee registering rainfall over 300 mm. Heavy rains in Nepal and Uttarakhand have raised alarm in downstream states of Uttar Pradesh and Bihar as several rivers are flowing close to their danger levels. Yamuna is also expected to reach its danger levels as rains in the Himanchal Pradesh and Uttarakhand have caused excessive discharge into the Hathini Kund barrage and subsequently into the Yamuna. Low lying areas like Mayur Vihar phase 1, Geeta Colony, Okhla, Usmanpur, Garhi Mandu, Badarpur, Khadar, ISBT Bridge and Shakarpur are expected to be the worst-hit areas in Delhi and a 72-hour flood warning was issued on Sunday. The axis of the monsoon has shifted northwards from the Indo-Gangetic plains to the Himalayan foothills. The monsoon is expected to weaken in north India over the upcoming week and activity will shift to eastern and northeastern parts of India with heavy rains expected over eastern Bihar, Jharkhand, West Bengal, Odisha and across the northeastern states. The southern peninsula is also expected to experience a few showers at isolated places.